The Low Down: Kali D’Angelo has known something was up since she was about twelve years old. Some days she feels completely human, some days, not so much. Her mother was out of the picture when she was three, so it has just been Kali and her absent-minded professor dad. Then, in the middle of her junior year, Kali’s dad decides that she needs to go to public school instead of the school she has attended since pre-K. She does not like making friends. She does not like having to care about people. One day at Heritage High, she meets Skylar Hayden. Skylar invites Kali to sit at lunch with her and her friends, a small group of outcasts that have been deemed socially damned. As Elliot, Skylar’s brother, speaks with Skylar, Elliot’s girlfriend, a popular mean girl named Bethany, tries to pull him back to the popular table. That’s when Kali sees that Bethany has been marked for death; she sees the ouroboros. Kali isn’t sure exactly what she is; she just knows that every other day she’s not human. She’s faster, stronger, and just about indestructible. Those are the days that she feels a pull, a calling, to kill anything preternatural that gets in her path. Not that she doesn’t go hunting for them first, mind you. When the sun comes up the next day, she’s a regular girl again; slow, weak and killable. When she sees the ouroboros on Bethany, and figures out it is a chupacabra, she decides to save Bethany the only way she knows how – she entices the things to leave Bethany’s body and come into hers. Now all Kali has to do is stay alive until the next sunrise, wait for her other self to kick in, and the thing will die. Only a few weird things happen first. She starts to hear a voice talking to her, telling her that the chupacabra is there to stay; that it will not kill her, but make her stronger; and the voice belongs to Zev, someone who is being held as some kind of test subject in an undisclosed location. Can Kali unravel the mysteries laid out before her before it’s too late? Best Thang ‘Bout It: Wow. There was a LOT going on in this book. It’s got you running from the first page through the end without a break. You get to find out who Kali is, what happened to her Mom, why snarky Bethany keeps hounding Kali, what’s up with Skylar, who Zev is, the secret behind the corporation where Bethany’s dad works and what the heck is an ouroboros. The thing is, it’s an awesome ride – more car wreck + Walking Dead + the killy parts of Harry Potter than Space Mountain without a lap bar, but there you go. And it’s plenty gory, too, if that’s your thang. I’m Cranky Because: I was a little confused at times about the difference between preternatural and supernatural; also, didn’t understand about how these creatures were found in the first place, and what level of acceptance there was for them in society. Should You? : Yes, even if you’ve got hellhounds on your heels, dragons sending flames your way AND corporate spooks trying to locate your position. 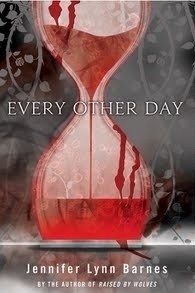 Every Other Day by Jennifer Lynn Barnes was published on December 27, 2011 by EgmontUSA.